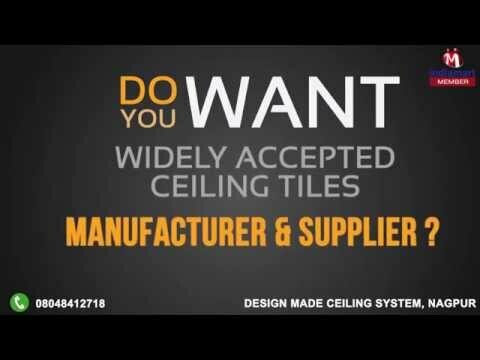 Welcome to Design Made Ceiling System, established in the year 2012, we are a reliable organization of this field actively engaged in manufacturing, supplying, distributing and service providing a broad assortment of Ceiling Tiles. In our effective range of tiles we are offering PVC Laminated Gypsum Ceiling Tiles, Tee Grid System and Mineral Fibre Ceilings. Offered tiles are manufactured and designed by utilizing only quality approved basic material in tune with the industry defined norms and standards at our well equipped processing unit. We are offering all these products under the brand name DesignMade. Our provided products are highly demanded by the customers for their excellent strength, smooth finish and minimal maintenance. Our provided products are highly installed in the classrooms, hospitals, stores and restaurants and help to enhance comfort, improve building efficiency and overall performance, save time and develop beautiful spaces.